Will the new craze of “Velocipede Riding” come to Newfoundland? There was much excitement in St. John’s during this week in 1869. The people of the town were anxious to see the “newly imported velocipedes” that were available for viewing at the Fishermen’s Society Hall on Queen’s Road. The velocipede was invented in France in 1865, upgrading previous bicycles with the addition of pedals to the front wheel. In 1868 E. B. Turner, an agent for Coventry Sewing Machine Makers, England, was on holiday in Paris where he witnessed the new craze of velocipede riding. Having tried the machines himself he returned to Coventry, England with a new velocipede and persuaded the machine manufacturers to revive their flagging fortunes by manufacturing the bikes themselves. These bicycles became known as `Boneshakers` due to the severity of the ride afforded by their solid wooden or metal wheels. In 1869 the Franco-Prussian War broke out and all metal production in France went to the War effort, therefore the French bicycle industry ceased temporarily and English production took over. In 1871 the penny farthing was invented and took over from the Velocipede, so ending its production. Recommended Archival Collection: Diary of Edward Morris, Archives of the R.C. Archdiocese, St. John’s. New Word: velocipede: French vélocipède, from Latin veloc-, velox + ped-, pes foot — fast foot. This entry was posted in Archival Moments and tagged boneshakers, Edward Morris, penny farthing, VELOCIPEDE on March 20, 2019 by Larry Dohey. February 2 is Candlemas Day – Blessing of the candles that are used during the year. Some of the best insights into the history of families and communities in this province can be garnered from the pages of the hundreds of diaries that have been deposited into archives in the province. In the diaries of Edward Morris, Mr. Morris observed on February 2, 1871. February 2 is “Candlemas” Day. 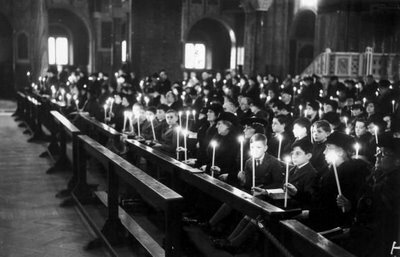 The ceremony of Candlemas Day, a ritual celebrated throughout the Christian world that Mr. Morris observed was the blessing of the annual supply of the Church’s candles. Beeswax candles were blessed by being sprinkled with holy water and having incense swung around them, and then the candles distributed to everyone in the church. Then there was a procession in which people carried lighted candles while the choir sang. The procession represents the entry of Jesus as light of the world into the temple. In Newfoundland there is an established tradition that on this day a blessed candle would be lit and the mother of the household would bless the children in the home with the candle. The wax was allowed to drip on the head (hat) and shoulders and on the shoes of the children. Every fishing boat would also have a blessed candle. These candles would be taken out and lit during a gale or storm. This day also used to have great significance on the calendar, because the date lies half way between the winter solstice and the spring equinox, so it marks the day upon which winter is half over! As Candlemas traditions evolved, many people embraced the legend that if the sun shone on the second day of February, an animal would see its shadow and there would be at least six more weeks of winter. “If Candlemas Day is gloomy & Glum the worst of winter is left to come. Eat your supper by the light of the day. The expression calls on families, now that we are half way through winter, to take stock of their (prog) food supplies in their root cellars and feed for the animals (hay). Just to insure that there is enough to get you through the rest of the winter. To this very day people still comment that walking about St. John’s is very rough. Please join the board of the Victoria Park Foundation on Saturday, February 9, 2019 from 4pm -6pm with our honorary Chair Mark Critch for an evening of sledding in the historic Victoria Park. Recommended Archival Collection: Edward Morris Diaries 1851-1887. Edward Morris was a businessman, politician, and office-holder; born in 1813 at Waterford (Republic of Ireland). He moved to St John’s, Newfoundland in 1832. On January 1, 1851 he began to keep a daily diary that he continued until his death on 3 April 1887. This entry was posted in Archival Moments and tagged branch, Edward Morris, fishermen, winter on January 31, 2019 by Larry Dohey. On 28 August 1917 Archbishop Edward Patrick Roche, the Catholic bishop of St. John’s wrote Prime Minister Edward Morris of Newfoundland with some concerns that he had concerning the “denominational division of the civil service” in the country. Church officials from all denominations staunchly defended positions in the Newfoundland civil service for their flock. They were following an entrenched principle of “denominational representation in government and the civil service” established as early as 1865. Also known as the principle of “denominational compromise” it was generally accepted that positions in the public service, from the Supreme Court bench to ferry men should be allocated in such a way that each denomination received a proportionate share of both jobs and the salary budget. The principle essentially meant that all patronage and government jobs should be distributed upon a perfectly fair denominational basis with the amount of patronage given to each denomination representing their share of the population. Essentially 1/3 of the jobs went to The Roman Catholics, 1/3 to the Anglicans and 1/3 to the Methodists. The leaders of all of the churches each year scrutinized what were referred to as the “civil lists” to insure that their denominations were well represented. These “civil lists” identified officials in all departments of government giving the salary and religious denomination of each. The analysis of the” civil lists” by church leaders was quite detailed. In his letter of 28 August, Archbishop Roche also observed “The salary of the superintendent of the Hospital (Protestant) is more than the Superintendent of the Lunatic Asylum (Catholic); the salary of the Inspector General (Protestant) is more than the Superintendent of the Penitentiary (Catholic). The principle of “denominational compromise” was well entrenched until 1934 when it came under review by the Commission of Government (1934-1949) they dropped old political and religious criteria in the hiring and promotion of civil servants making merit the sole basis for promotion. (It is interesting to note that when the commission of government was established in 1934, the positions for the three Newfoundlanders were allocated on a denominational basis: Alderdice (Anglican), Howley (RC) and Puddester (UC). Recommended Archival Collection: At the Provincial Archives Division at The Rooms see GN 2.41 This series consists of the names, occupations, dates of appointments, terms of office and religious denominations of civil servants of St. John’s and Newfoundland. This entry was posted in Archival Moments and tagged Archbishop Roche, catholic, Charles Hutchings, civil lists, Commission of Government, denominational compromise, Edward Morris, Inspector of Police, John J. Sullivan, Lunatic Asylum, Protestant on August 26, 2018 by Larry Dohey. The expression calls on families, now that we are half way through winter, to take stock of their (prog) food supplies in their root cellars and feed for the animals (hay). Just to insure that there is enough to get you through the winter. This entry was posted in Archival Moments and tagged branch, Edward Morris, fishermen, winter on February 1, 2018 by Larry Dohey. A tiff over fashion, what to wear to church on Sunday? What will I wear to mass? Edward Morris, the Manager of the Newfoundland Savings Bank in St. John’s, Newfoundland in his diary for July 23, 1854 wrote that he had a wee tiff with his wife (Katherine Howley) it appears she was not happy with him, she was in fact so displeased with him that she refused to go to church with him. The 8 o’clock mass tended to be the mass that the kitchen maids, scullery cooks, chamber maids, house maids, sewing maids and the other servants attended. The staff would all get up early, attend the mass, and be home before their employers and their families got up. There was no compromise, Edward insisted that he was going to the regular 10 o’clock mass, he was not concerned about the latest clothing fashions. Edward was quite pleased that he did attend this particular mass and no doubt delighted in reminding his wife that during the celebration he was witness to a great deal of history. The statues of the four evangelists, St. Matthew, St. Mark, St. Luke andSt. John are located some thirty feet above the floor of the Cathedral. These are of Italian workmanship. They are of marble and are slightly larger than life-size. Each evangelist is shown with his appropriate symbol: St. Matthew with a child; St. Mark with a lion; St. Luke with an ox; and St. John with an eagle. The gallery is now situated behind a grilled window set in the east wall of the apse. From the small room behind this window, the Sisters of the Presentation can participate in the Parish Masses. Recommended Archival Collection: At the Archives of the R.C. Archdiocese: The Edward Morris Diaries: Edward Morris was a businessman, politician, and office-holder; born in 1813 in Waterford (Republic of Ireland), son of Simon Morris. In 1852 Edward married Katherine Howley ofSt John’s. This entry was posted in Archival Moments and tagged basilica, bishop mullock, Cathedral, Cathedral Bells, dress, Edward Morris, Evangelist, fashion, Katherine Howley, nuns, Presentation Nuns, scullery maids, St. Patrick Bell on July 20, 2017 by Larry Dohey. The jobs that the 500 Newfoundlanders were seeking by taking the Steamer ‘Merlin from St. John’s to Nova Scotia were jobs on the inter colonial railway, under construction, linking the Maritime colonies and Canada. Completion of the railway was made a condition of Confederation in 1867. The out migration, that Edward Morris witnessed, by his fellow Newfoundlanders is a constant theme in Newfoundland history. The people of Newfoundlandand moved to other countries for a wide range of reasons throughout the 1800’s, emigration occurred on the largest scale during the last two decades of the century when the cod fishery fell into severe decline and caused widespread economic hardship. In more recent years Newfoundland and Labrador has witnessed (1996 and 2001) about 47,100 people pulling up stakes and leaving the province. The Conference Board of Canada’s most recent long-term forecast predicts the province’s population will fall from about 527,000 now to 482,000 by 2035. Despite baby bonus incentives and other government efforts since 2008, the population is expected to shrink more here over the next two decades than any other part of Canada. An aging demographic will be compounded by out-migration of workers — especially if offshore oil production wanes. Recommended Reading: Newfoundland: Journey Into a Lost Nation by Michael Crummey and Greg Locke. McClelland & Stewart. Chronicles the passage of a time when cod were still plentiful and the fishery shaped the lives of most of the island’s inhabitants, to the present, when an economy, propelled by oil and mineral development, is recasting the island’s identity in a new mould. This entry was posted in Archival Moments and tagged Boston States, colonial railway, Edward Morris, emigration. work, employment, fishery, Merlin, out migration, St. John's, statistics Canada on May 29, 2016 by Larry Dohey. The Redeemer in Death, Basilica Cathedral, St. John’s. 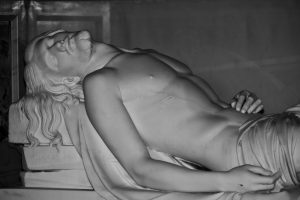 “The Dead Christ” – was sculpted in Carrara marble by the Irish sculptor John Hogan in 1854. Bishop John Thomas Mullock, on one of his visits to Rome, purchased the statue and had it placed beneath the table of the High Altar on March 9, 1855. Since it was installed in the Basilica it has twice been moved to new locations, first in 1903 when the Sanctuary was expanded and again in the early 1970’s when it was moved to its present position. Hogan created two other versions of the statue; the first version (1829) is located in St. Therese’s Church, Dublin, Ireland, the second (1833) in St. Finbarr’s (South) Church, Cork, Ireland. Other works by Hogan include the Sleeping Shepherd and The Drunken Faun. Hogan assured his international reputation in 1829 with The Dead Christ; thereafter, his creations were snapped up by Irish bishops visiting his Rome studio. Hogan was a great supporter of the Irish movement for independence and went on to create a marble statue of Daniel O Connell, an important figure in the movement. The statue stands today at City Hall Dublin, the same spot where O’Connell gave his first speech against the Act of Union in 1800. Hogan died at his home in Dublin, in 1858. Recommended Archival Collection: Edward Morris Diaries, Archives of the Roman Catholic Archdiocese of St. John’s, NL. Recommended Reading: A full account of Hogan’s life and works, with a catalogue raisonée and bibliography, is given by John Turpin in John Hogan: Irish Neoclassical Sculptor in Rome (Irish Academic Press, 1982). Recommedned Tour: Visit the Basilica Cathedral in St. John’s and enjoy the large collection of art work that adorns the building. The Basilica Cathedral is home to art created by internationally celebrated artists like John Hogan, Edward Carew, Louis Koch, and Gerry Squires. If you were visting another city you would likely visit the Cathedrals and museums, why not do it in your own city! This entry was posted in Archival Moments and tagged basilica, carrara, Dead Christ, Edward Carew, Edward Morris, Gerry Squires, John Hogan on March 8, 2016 by Larry Dohey.